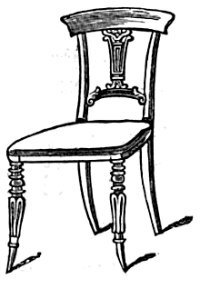 Black and white drawing of a fancy chair for a drawing room. Chairs like this one were among the height of fashion in 1852 and were identified as “cottage furniture” in a popular lady’s magazine of the day. This simple chair drawing can be used alone or easily used in a more complex drawing. It was included in the June 1852 issue of Godey’s Lady’s Book.